We maintain control over the whole process from initial tool design and tool making through to the final assembly and testing. This ensures that only products of the highest quality are produced. The company believe that it is this commitment to quality that has led to it receiving prestigious awards from many of the world’s leading testing and approvals organisations. NOTE: This specification refers principally, but not exclusively, to fittings from our Compressed Air range prefixed PM and MM. Other fittings, valves, tube and ancillary products have their own Technical Specification. The above is for use with air. For below 0°C please consult our Customer Services Department. The John Guest Compressed Air System is suitable for the following temperatures and pressures. The above ratings are for air. For use with other fluids or other tube or at other temperatures and pressures, please consult our Customer Services Department. John Guest fittings are intended for use with John Guest nylon pipe but are also suitable for use with a wide range of plastic and soft metal pipes including UPVC, ABS, Polyethylene, Nylon, mild steel and copper to the tolerances set out below. Soft plastic pipe, such as Nylon should have a minimum wall thickness of 1.5mm. The pipe must have a good quality surface and be damage free. The following maximum torque values should be applied. Do not overtighten plastic fittings as this could cause undue stress and eventual failure. Recommended torque figures are shown above and must be adhered to. John Guest recommend OEM customers consider replacing threaded ‘ports’ with the modern method of using John Guest Cartridge Systems. Details of which products are made from acetal are shown in our catalogues but generally John Guest products incorporating acetal are designated by the part number prefix PI, PM, CI, CM and RM. 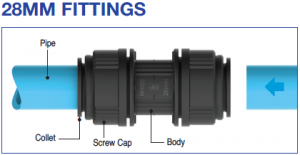 Polypropylene fittings offer greater resistance to aggressive chemicals than acetal fittings. Polypropylene does not have the same mechanical properties as acetal and John Guest polypropylene fittings are generally designated by the part number prefix PP and PPM. The pressure rating and installation guidelines of the tubing involved must also be considered during the design of a compressed air system. Pipe should be supported at minimum 800mm to prevent excessive load being applied to the fitting. These supports should not be closer than 25mm from the end of the fitting. 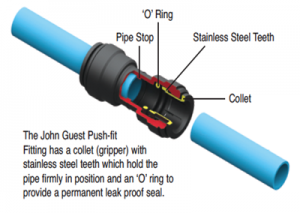 John Guest fittings and pipe should only be connected after the air receiver and not direct to a compressor. We recommend collet covers be fitted when pipework is hidden inside walls and ceilings. It is recommended that all pipe and fittings installations are pressure tested after installation and before handing over to the final user. The company has a policy of continuous research and development and reserves the right to amend without notice the specification and design of all products. John Guest reserve the right to change the colour and shape of products. Photographs are for illustration purposes only. Cut the pipe square. We recommend the use of the JG Pipe Cutter. DO NOT use a hacksaw. To avoid damage to the ‘O’ ring remove burrs and sharp edges. Push up to pipe stop. Pull to check secure. Test the system before use. To disconnect, ensure the system is depressurised. Push the collet towards the fitting and remove the pipe. The fitting can be reused. 28mm fittings also have a collet with stainless steel teeth and an ‘O’ ring. After inserting the pipe, a screw cap is turned approx 1/4 turn. This locks the collet in place and reduces lateral and sideways movement of the pipe. To disconnect, turn the screw cap 1/4 turn, push in the collet and remove the pipe. The fitting and pipe can be reused. Whilst we recommend the use of John Guest Rigid Nylon Pipe, John Guest Fittings can also be used with copper or aluminium pipe. Designed to simplify pipe connections in restricted spaces, the Stem Elbow gives an instant swivel fitting so a pipe can be orientated in any direction. Can be used with an elbow to make ‘U’ turn connection. Please note a collet cover cannot be used on a Speedfit end assembled with the stem of a 22mm Stem Elbow. Can be used with a Tee. 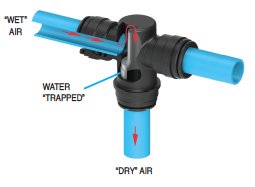 The new Water Trap Tee from John Guest solves the on-going problem of moisture in acompressed air system and provides the easy alternative to the need to install “Swan Necks”. 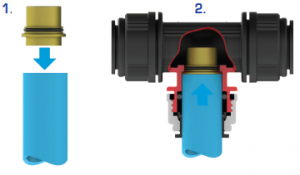 The ingenious inside arrangement of the fitting allows air to flow, with minimum head loss, from the main to take-off point without allowing water to follow. The moisture is retained in the line to be drawn off at some suitable location. It is of vital importance for the correct function of the Water Trap Tee that the air distribution system be nearly horizontal and that the outlet port be facing downwards. The Water Trap Tee Convertor is a simple convenient way of converting a standard John Guest 28mm Tee to a Water Trap Tee. This will stop condensing water entering the vertical take off spur. The air supply needs to be installed with the correct fall and water drain points regularly vented. Use either John Guest 28mm Nylon Pipe or 28mm copper pipe. The pipe to be cut square and be free of burrs. Press the shorter spigot into the pipe. The fit on copper pipe will be loose, this will not affect the function. Push the pipe and convertor up to the pipe stop of the centre leg of the tee. Turn the screw cap approx 1/4 turn to lock the pipe in position. The End Stop can be used to provide a permanent connection or a temporary shut off. 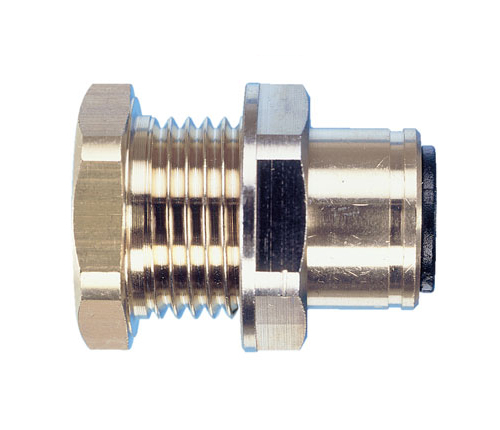 Because it is easy to disconnect the fitting from the pipe, the End Stop can be put in place to be removed at a later date to allow a system to be extended or modified.